One of the favorite ways in which media outlets (like CNN and The Washington Post, see below) spin the news for us is by REDEFINING the terms to prove the opposition wrong. If you think we mean that certain outlets ALWAYS spin, then you are missing our point. We are all given to spinning because of our biases; however, certain news organizations clearly spin more than others. True? Media have continued to enter into the domain of politics by taking a slant on the news in order to influence public opinion. Redefining terms is a favorite tool of all spin-meisters. Fact Check: While it’s technically true, it needs some context. Donald Trump was sworn in at 70 years of age, but relative to life expectancy, he is actually among our youngest presidents. Trump was 70, but life expectancy at the time was 78 years old in the United States. In contrast, consider Abraham Lincoln, who was 52 years old when he became the president. The life expectancy in 1861 was only 40.5 years in the United States. Relative to the population, Abraham Lincoln was much older than Donald Trump, therefore Trump’s point of accomplishment is nothing much to write home about. Now, do you get the idea? A term is REDEFINED to suit an argument or analysis to support a bias or slant in the ‘reporting’ or opinion piece. You’ll notice it often once you start paying attention to this tactic. Here’s an example from the world of news. (CNN March 4, 2019) While praising President Donald Trump during his remarks at CPAC, Vice President Mike Pence listed off some of the accomplishments he believes the administration has made in its first two years. Among them, of course, was the 2017 tax reform. "With the support of this generation of conservatives, President Trump signed the largest tax cut and tax reform in American history," the Vice President said. "That's promises made and promises kept." CNN and the Washington Post (and others) took exception to this claim and called it false in early 2018. CNN – The biggest tax cut in history? Not quite. Washington Post - Fact Check: Biggest tax cut in U.S. history? President Trump’s tax cuts are the biggest gross tax cuts in American history, cutting over $5.5 trillion in taxes over ten years. The President’s tax law included substantial reforms to make taxes simpler and fairer, which helped offset the cost of the tax cuts and thereby limit the net tax cut to $1.5 trillion. President Trump cut the corporate tax rate from 35 percent to 21 percent, the largest percentage point reduction of the top marginal rate in history. President Trump’s tax cuts include the biggest increase in the child tax credit in history. So, if Trump/Pence meant that it’s the largest dollar amount tax cut in history, then they are not factually wrong. They said and meant what they said and meant (though it can be it’s own spin, perhaps). For the Washington Post to give Trump four Pinocchio’s and then base it on ‘the best way to compare’ is a spin using redefinition. In other words, neither Trump nor Pence meant what the Washington Post or CNN said they should have meant. Trump/Pence: "President Trump signed the largest tax cut and tax reform in American history." What did they mean by what they said? That will guide you well through the brackish water of spin into the clear waters of the Gulf of Truth. While we are not a fact-check site per se, it is important to notice that Ocasio-Cortez is asserting that there are people in Alabama who are contracting ringworm because they don't have access to public health. There is so much wrong here it is confusing to even address. It might be surprising to those from (ironically) the Empire State to learn that Alabamians actually have health care. It may not be in the top tier nationally, but by world standards it's certainly able to handle ringworm. Of course, she probably meant pinworms. Ringworm is a fungus that is contracted in numerous ways everywhere. When the fungus is between the toes it's called 'athlete's foot' and 'jock itch' when in that vicinity. It is commonly spread in public places and has nothing specifically to do with the quality of health care in a state (though flip-flops in a public shower may help). Oh, pinworms are everywhere too. This is known as a False Dilemma or the Either/Or Fallacy. She is saying that it is immoral or wrong for the system to allow individuals to have a billion dollars when there are injustices (like the Alabama Ringworm Epidemic) that could be erased with the money. While there are more complex nuances in saying something is immoral, the naive argument is that preventing individuals to amass wealth would guarantee solving real-world problems. While sometimes things are either/or, it is pretty rare in the economic or political worlds. If money cures what ails us, then the lottery winners would all do exceptionally well. Sadly, they don't fair well and are far more likely to go quickly bankrupt than the average American. The spin is to set up an apparent contradiction to force a choice that is patently unnecessary. It's a very common problem in politics because of the emotional nature of locking one's identity into a cause or person. Are you a Never-Trumper or an Always-Trumper? In a False-Dilemma there is never a third option (sometimes Trumper). When Ocasio-Cortez says the system shouldn't allow people to make a billion dollars, she is specifically talking about removing one's freedom. Of course, the billion mark is arbitrary. It could be a million or one hundred thousand just as easily. It's a perfectly anti-freedom, pro-socialism, spin that ignores both the reality of problems like the Alabama Ringworm Epidemic or the truth surrounding how much the wealthy contribute to things like the growth of the economy and humanitarian efforts (see Bill & Melinda Gates Foundation). Don't fall for this spin: It's immoral to allow people to keep their money because that money would otherwise be solving problems. why would that mean the Alabama Ringworm Epidemic would go away? This question exposes the dilemma and invites clearer thought surrounding 'how it works'. "President Trump on Monday denied that he offered Sen. Elizabeth Warren (D-Mass.) $1 million to take a test proving her Native American heritage, even though he did just that." The spin here isn't concerned with the facts exactly, but with the writing within the article itself. The claim is that Trump offered to pay if Warren 'took the test' ---but that is also contradicted in the article. In fact, contradiction and incongruence is often a sign of spin. THE HILL: "Trump spoke after Warren responded to the president's challenge and released the results of a DNA test showing she has a distant Native ancestor. 'I didn't say that. 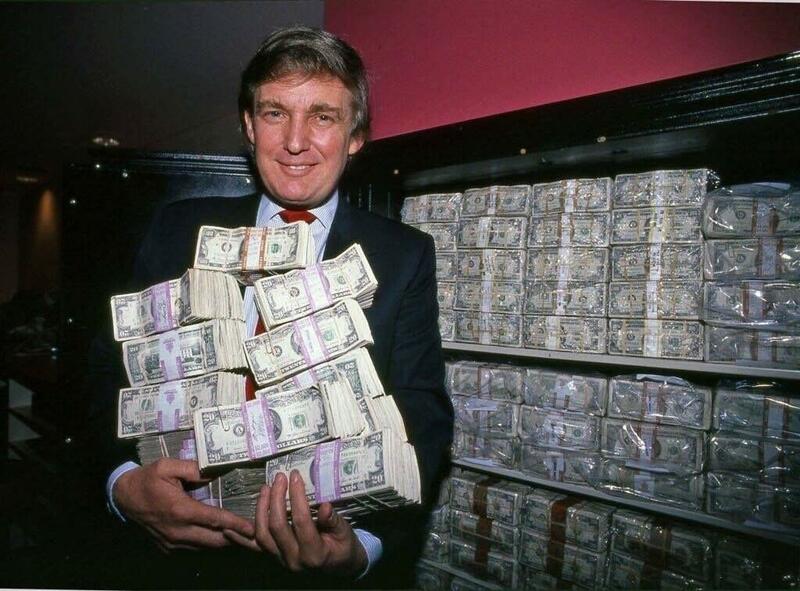 You'd better read it again,' Trump told reporters at the White House when asked about his $1 million offer." "I will give you a million dollars, to your favorite charity, paid for by Trump, if you take the test and it shows you’re an Indian," Trump said at the time. "I have a feeling she will say 'no.' "
SHE DIDN'T SAY, "NO." BUT, SHE'S ALSO NOT A NATIVE AMERICAN. Fabian/The Hill is asserting that Trump promised 1 million if she took the test, but later notes that 'SHOWS YOU'RE AN INDIAN' is a necessary condition. The spin is that she 'merely' need to take the test to call Trump out, but that isn't Trump's offer, despite Fabian's claim. By any standards of genetics or common sense, Elizabeth Warren is not a Native American. In fact, statistically speaking, Trump himself may actually be more Native American than Elizabeth Warren. While this could be a fact-check issue, it's really about spin. The spin here is that a conclusion is asserted based on one part of a statement while looking past the other part of the statement. Often when we dig in the same article, we can find the spin on the truth. This isn't about facts or ideology, liberal or conservative; it's about framing the known information in such a way as to guide the reader to a certain conclusion. Trump clearly was not saying, "Take a DNA test and if you have any amount of Native blood, I'll donate a million dollars." He said what he said, "I will give you a million dollars, to your favorite charity, paid for by Trump, if you take the test and it shows you’re an Indian." Senator Warren took the test and is not a Native American, so the promise isn't violated. Did The Senate Reject The MeToo Movement When It Voted Brett Kavanaugh In As A Supreme Court Justice? “Brett Kavanaugh Confirmed To Supreme Court As Senate Rejects Me Too Movement” (click to see Huffington Post Article). Clearly this is a spin which pitches a false dichotomy. Either you support the #MeToo Movement by voting against Kavanaugh OR you reject the #MeToo movement by voting for Kavanaugh. This is a little nightmarishly amateur, but since we are in the process of learning about spins on this site, this seems a good place to start. this is a good thing; in fact, it is a wonderful thing to see women speak out about abuse. The problem, hence the spin, occurs when speaking out is equated with infallibility. Just because someone speaks out or makes an assertion, why does that mean they are in the right? This leads us to how the spin uses a common logical fallacy. This means that there are no other options. You love me or hate me, help me or hurt me, cheer me or curse me. When we think past the False Dilemma, we can quickly ask a fresh question, ” If the Senate had rejected Kavanaugh, would it then be a supporter of the #MeToo Movement? Of course, the jury would be out and we’d only be ‘the next vote’ away from a fresh accusation. The reality is that accusations themselves are valid or invalid until they are proved or support to be so. The spin in this discussion presumes that an accusation is valid; however, for that to be true then the accusers must be incapable of deceit, deception, or confusion. Said differently, we must believe that any woman who makes an accusation is 100% honest and accurate. While there are other possibilities, these are sufficient to show that the spin in play was to remove all options from our thinking so that we too must conclude the MeToo Movement is flawless and the Senate is evil. This isn’t about facts exactly, but about how the authors are spinning the bits of data to make you conclude what they want you to conclude. Think for yourself.Finally, and not much mentioned in the media, the Senate’s approval of Kavanaugh itself came down to about four votes on this issue. Therefore, another spin in play is that the decision of a bare-majority dictates the conclusion (according to the HuffPo writers)) that the ‘Whole Senate’ is against the MeToo Movement. Have we solved the issues surrounding the #MeToo Movement? No, not at all. However, here we are concern with the spin in the HuffPo article, not the weightiness of the issues involved. See the HuffPo SPIN that the Senate as an entity has rejected the #MeToo Movement and move along.